Record client invoice payments, supplier refunds or other income. Client payments denote income that comes from your company's main business. You may associate a client payment with one or more invoices, so that they're marked as paid. To create a new client payment, from the main menu select “Payments received". Click on the "+ Add" button and select "Client payment". First of all, you must specify the client who made the payment. Once this is done, Elorus will look for any outstanding invoices that the client might have. Later on, you can use the payment amount to pay off these invoices. If there is a default currency set on the client contact, the payment will also be updated to match that currency. Of course, you can always change the currency manually, any time. Next, you must set the transaction amount and date. Please note that, if the payment currency does not match your default currency, the exchange rate will be automatically updated to reflect the actual exchange rate of that date. Once again, the exchange rate can also be manually edited. To help you quickly identify this transaction, you may optionally add a short payment description as well. Last but not least, if you want to use this payment to mark one more invoices as paid, you must distribute the amount to the corresponding invoices in the last section of the page (see image above). The remaining amount (i.e. part of the payment amount that is not associated with any invoice) is called "amount in excess". The excess amount typically represents advance payments or over-payments and will be available to pay-off future invoices. Naturally, the amount in excess must always be positive or zero; i.e. the sum of the individual invoice payments cannot be higher that the payment's total amount. Whenever you're done editing, just click "Save". Client payments may be exported to PDF or be printed out, to provide your clients with a payment receipt. 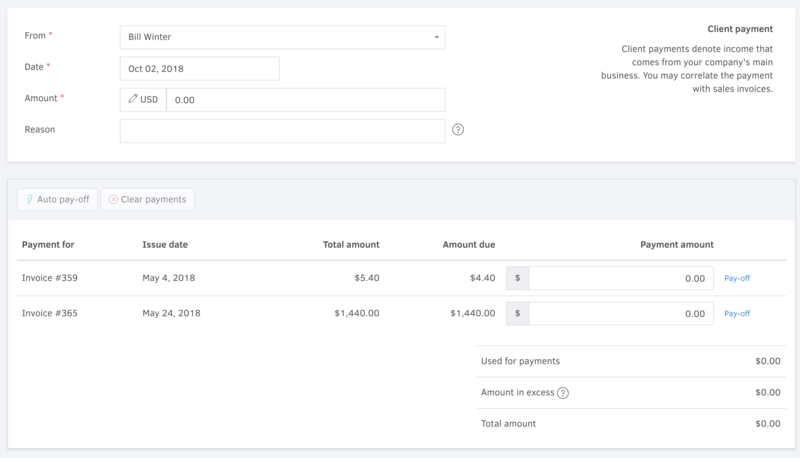 The receipt will be rendered using the client's default template (the same as with invoices and estimates), or your organization's default template if there's no client template specified. To export the payment receipt, first visit the payment detail page. To do so, from the main menu select "Cash flow -> Payments received" and click on the desired transaction. From there just click the "PDF" button to the top of the page. If a supplier provides you with a refund, for example, because you returned faulty goods after you paid for them, you have to record this transaction as supplier refund. You may associate a supplier refund with one or more purchase credit notes, so that they're marked as paid. The process of adding a new supplier refund, is the same as with client payments (see previous section). The only difference is that supplier refunds are associated with suppliers -rather than clients- and are used to pay off outstanding purchase credit notes instead of invoices. This type of payment refers to income that does not come from your company's main business. Income from interest is an example of other income. To add other income, from the main menu select To create a new client payment, from the main menu select “Payments received". Click on the "+ Add" button and select "Other income". As seen on the image above, to add a new record you must first specify the contact (either a client or supplier). If there is a default currency set on the contact, the payment will be updated to match that currency. Next, the transaction amount and date must be filled. You may also specify an optional description to help you quickly identify the transaction. Once you're ready, click "Save". Please note that, as opposed to client payments and supplier refunds, other income records do not participate in the client / supplier statement of accounts reports, as they represent payments outside the invoicing workflow. Tracking categories is a powerful reporting tool to help you track down received payments. You may tag and categorize received payments and then filter or group the related reports' data based on these categories. You may tag all kinds of payments received: client payments, supplier refunds as well as other income. Once you've set up tracking categories that apply to payments received (see the related article for instructions), you may tag the individual payment records via their add / edit form pages. To facilitate quick updates, a corresponding widget is also available to the side of the payment's detail page (as seen on the above image).